When in 1846 Frederic Chopin (1810-1849) completed the Barcarolle, the last work of its relatively large size to come from his pen, he was already laid low by the fatal illness that three years later would take his life. He must have had deep affection for the piece, for he included it on the program of a concert he gave in Paris, February 16, 1848, his last appearance in his loved adopted city. 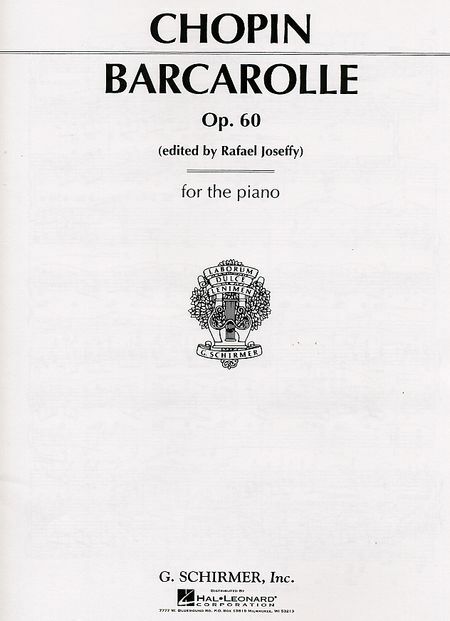 Reports of the event tell of this physically depleted man unable to play much above the level of pianissimo even in the Barcarolle’s most expansive sections, a depressing experience for his many friends in the audience.The Barcarolle is the single work of its type in his catalog, which is not surprising considering the limitations imposed by the necessity to maintain a “boat” accompaniment and to invent suitably artless – gondoliere – melodies. In light of these specific guidelines, Chopin has created a composition of remarkable continuity and diversity having, in this temperate context, unexpected dramatic intensity in a soaring climax. (Sudden storm on the Venice canal?) Read more of the notes here.